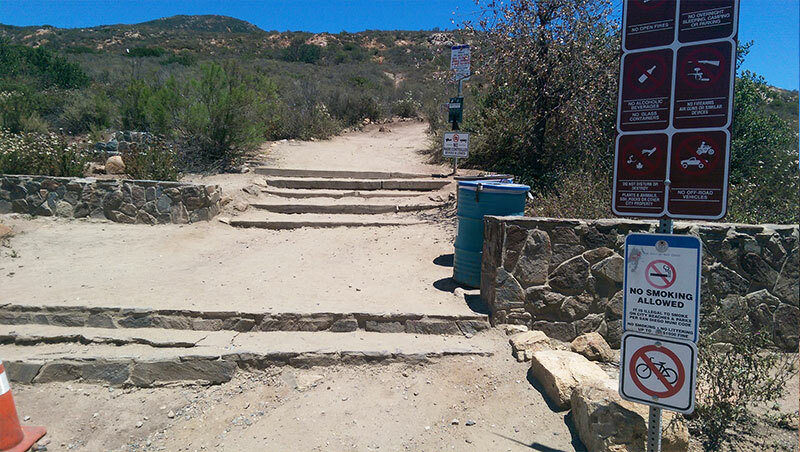 Cowles Mountain Trail hike is short and kid friendly. Dogs are allowed on the trail as well, making it a popular destination for everyone, from families to fitness fanatics, both young and old alike. 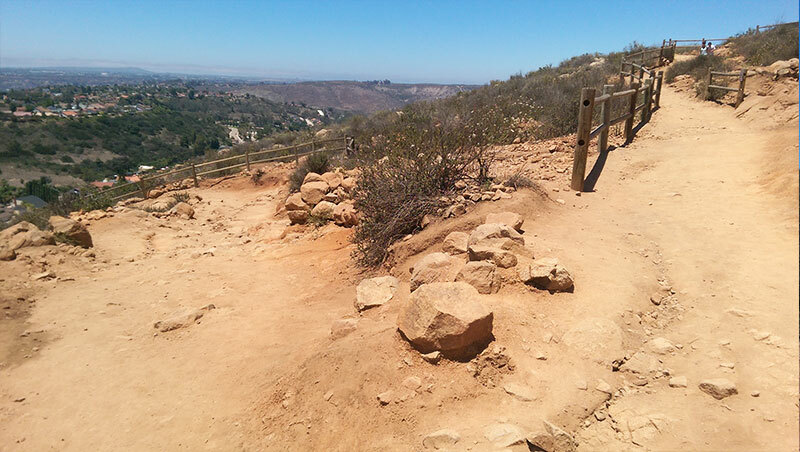 The trails can get crowded, even on weekdays, and parking can be hard to come by. 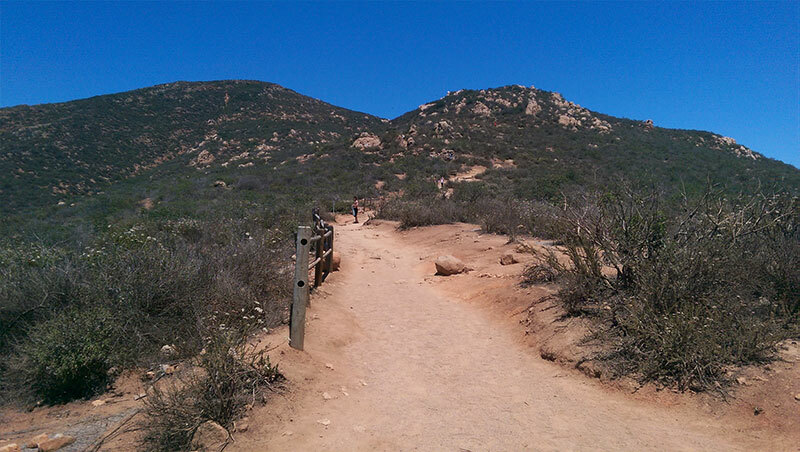 Getting an early start is a great way to beat the crowds, but don’t expect a quiet, secluded nature hike, because you won’t find it on Cowles Mountain. The Golfcrest trailhead leads you to a series of switchbacks that gradually wind their way up the southwest face of the mountain, assisting your 1.5 mile ascent up to the 1591 ft. peak. A fence designed to keep the surrounding habitat from shortcutters lines most of the trail, so getting lost or losing track of the trail is almost impossible. The trail is wide enough that fast hikers and runners can keep up their pace, making this a popular destination for fitness enthusiasts. Even so, it’s good to get there early if you hope to beat the crowds, especially on weekends. 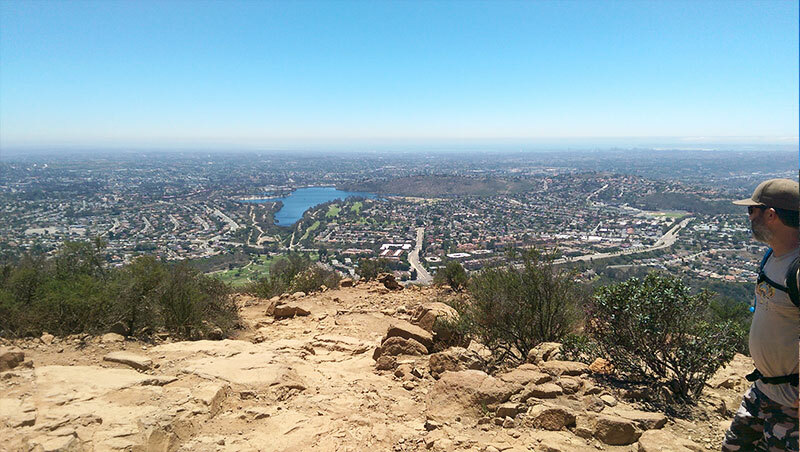 The effort you put into getting to the top of Cowles Mountain is quickly rewarded with a 360 degree view that , unmatched anywhere in San Diego. 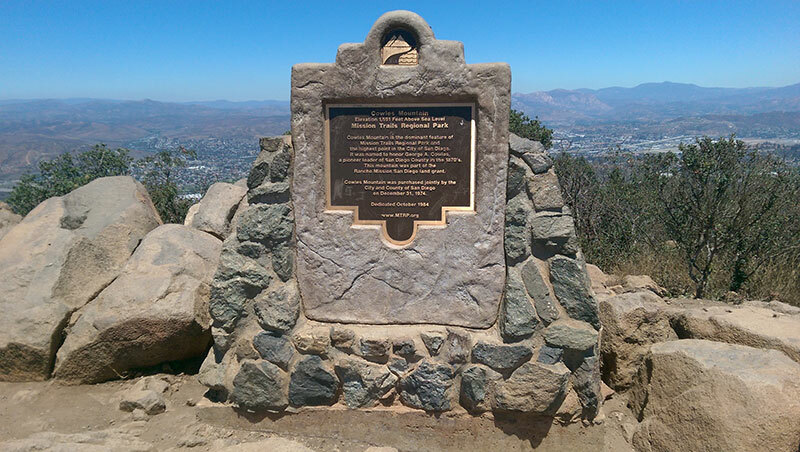 The plaque at the peak tells a brief history of the park, and two more plaques name points of interest visible in all directions. 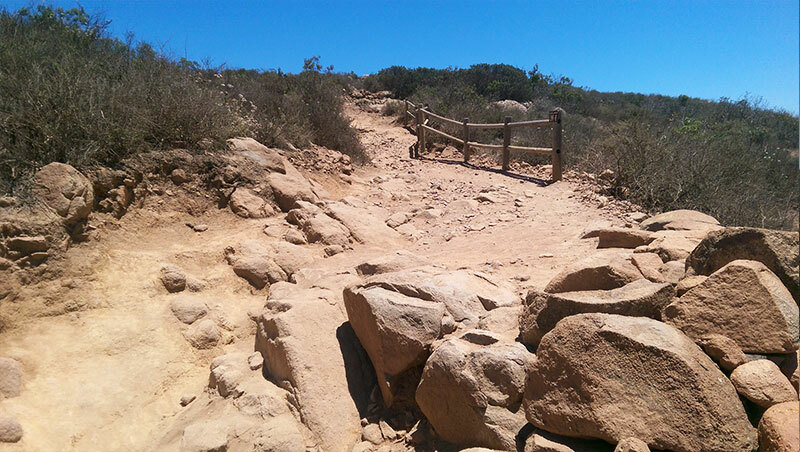 Despite the view at the top, Cowles Mountain Trail loses two stars for having inadequate parking, a never-ending stream of hikers, and for being a short and relatively uninteresting hike. We hiked the trail on a hot Friday afternoon in July. The crowds weren’t overwhelming, but there was a constant stream of people ascending and descending the trail. The small parking lot at the trailhead was full, so we parked on the street and had a short walk to the trailhead. Wear good shoes. The trail is a little rough. Despite a few ruts and loose rocks resulting from heavy wear, the trail is well-maintained, as shown by the rangers with shovels in hand we passed. A diverse group of high-school kids, families and dog owners, runners, gym rats and a few geared up, avid hikers made up the crowd. Everyone was having a good time and enjoying the hike in their own way. 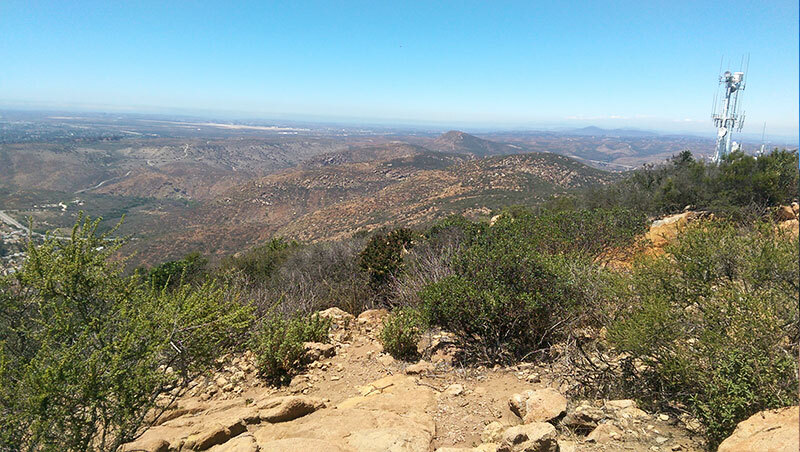 By the time we arrived at the trailhead, we had already hiked a 10.25 mile loop on the north end of the park, summiting North and South Fortuna Peaks, and Kwaay Paay Peak. The temperature by this time was about 90 degrees, so we approached Cowles Mountain with a little less energy than the others. Completing the trip took us about 1.5 hours, including the time we spent at the top enjoying the view.